A Cirque du Soleil performer has died after falling during a performance in Tampa, Florida, on Saturday, March 17. Aerialist Yann Arnaud fell onto the stage while performing the aerial straps routine, said Cirque du Soleil in a statement posted to its social media accounts. “It is with immense sadness that Cirque du Soleil Entertainment Group reports that a tragic accident occurred last night, March 17, during a performance of its show ‘Volta,’ in Tampa, Florida,” the statement said. Arnaud was taken to hospital where he later died from his injuries. The acrobat had been performing with the company for 15 years. An audience member that night, Julian Martinez, told WFLA that he noticed Arnaud was “straining to hold onto the rope” before the fall. The company says it is currently “gathering more information” about the incident and will cooperate with authorities. The last two shows scheduled in Tampa on Sunday, 18 March, were also canceled. This isn’t the first time a Cirque du Soleil performer has been killed in an on-stage accident. 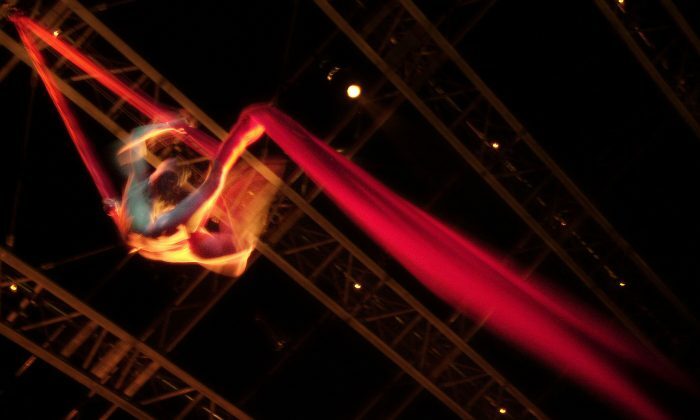 In June 2013, 31-year-old aerialist Sarah Guillot-Guyard died after a fall during a show at a Las Vegas casino.